Make Money – A Live Trivia Quiz Online and Win Real Money! Make Money is a real money quiz game which helps you earn real cash. It’s actually quite thrilling to take part in a live quiz show and win cash every day. The game is presently available for Android only and it’s available on Google Play Store. The questions asked are relatively easy and help you earn coins. The key benefit of this quiz puzzle is that you can convert the earned coins into cash reward instantly by transferring into your Paytm e-wallets. You need to pay Admin charges for every transaction and the minimum pay-out limit is Rs. 50 & 1 USD. Make Money is a quizzing & trivia game app which asks you GK-based questions to test your Trivia skills and earn make cash! 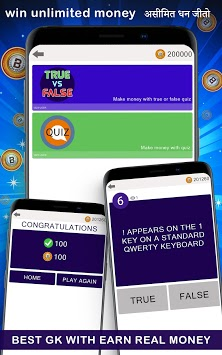 The objective behind this prime quiz game is to increase general knowledge and also help people to earn big time money. With this real cash quiz, you can easily make money. Make Money offers you questions on general knowledge, which are easy to answer as well as doesn’t require any distinctive skills. Make Money is particularly made for the people that want to earn some pocket money with fun too! 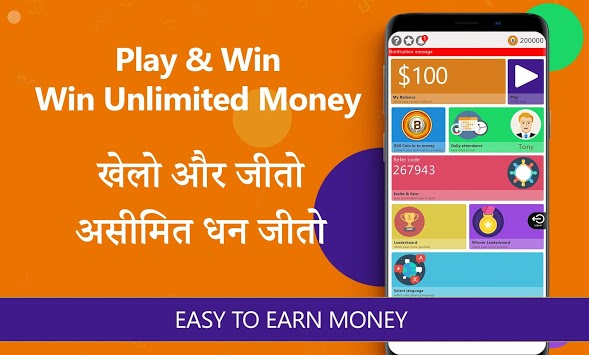 You will earn coins with every right answer as well as you can cash in your coins into real money which can be directly transferred to your Paytm account. Make Money is an exceptional online win money app which helps you ‘earn while you learn and play’. With endless questions and easy playing, we make sure that you can earn cash easily with fun! You will have thousands of questions with different niche including Current Affairs, World GK, Mathematics, Daily Current Affairs GK, IQ, etc. to increase your general knowledge as well as help you to prepare competitive exam or all exams. You will have rewards coins for every right answer. We have tried our best to ensure that you love playing Make Money as well as win prime quiz cash at the same time! Just play and win! Here, you can make money with Make Money. Here, you will have two options for every question, true or false and you have to predict the right answer. You have only limited seconds to do that. Here, you can make money with your knowledge. You will get questions which will have 4 options. You need to find the correct answer from the given options. Just download the Make Money App from Google Play Store. You can sign in through your Facebook or Google+ account. •	My Balance: You can check your current income here. •	Play: You will get the game options here, ‘True VS False’ and ‘Quiz’. •	Coin into Money: You can convert coins into money. •	Daily Attendance: Here you can collect your daily bonus. •	Your Refer Code: You can invite & earn with your promotion code shown here. •	Leader Board: Here, you can check your earning wise position online. •	Winner Leader Board: You can check top paid user here. •	Select Language: You can check one language from English, Hindi and Gujarati. Make Money is an exclusive quizzing & trivia game app which helps you earn with learning at the same time. With great features and unlimited questions, we ensure that you always love the game and make money.